Apple was right when it promised that the then-forthcoming iOS 5 will be the world’s most advanced operating system. In spite of the passing of its legendary co-founder and visionary, Apple managed to retain its position as a leader in the mobile space. Now that the iPhone 4S has been released, the wind seems to be blowing in favor of the Cupertino giant’s side. You will probably agree that the rich blend of Apple’s intricate hardware signature and the sheer brilliance of its iOS mobile operating system is what makes the company great. The iOS 5 in particular, currently considered as the most sophisticated mobile OS, has over 200 new features. Today, we will define why the iOS 5 is such an amazing platform. Kudos to Apple for finally coming up with a beautiful and fully functional notification center. With the new notification center in iOS 5, you can now get all your important notifications and alerts in one place – text messages, email, social networking updates and even the stock ticker and weather notification. iMessage is another cool feature in iOS 5. Talk about uniting the entire iOS community. iMessage is the new messaging service developed by Apple for its iOS users. Integrated into the Messages app, iMessage will allow you to send unlimited text messages, photos and videos via 3G or Wi-Fi. There’s also group messaging for faster collaboration and message tracking using the optional delivery and read receipts. Task managers such as Remember the Milk and Todoist are extremely popular in the iTunes. Now GTD fans can enjoy Apple’s very own task manager – Reminders. Pour in all your tasks and to-do list for the day using this cool app that can also synchronize with iCloud and other popular calendars in the app market. But make no mistake of thinking that Reminders is just like your ordinary organizer. What separates Reminders from the rest is its location-based feature that is capable of giving alerts once you are in the designated area. Twitter is also now fully integrated within the iOS 5’s main system. You can virtually sign in once via Settings and tweet forever even when you are browsing other sites, using the camera, viewing photos, watching videos in YouTube or locating places in Maps. Take the whole Twitter experience a step further with this new feature in iOS 5. Things are getting better over at Appletown. Stay up to date with the latest news and trends in your favorite niche with Newsstand. Newsstand allows you to organize all your magazine and newspaper subscriptions in one place. The App Store also has a new special place for newspapers and magazines. With Newsstand, you can grab those publications in a snap as it directly uploads into your own personalized Newsstand folder for easy access. Long gone are the days when newspapers are delivered in your front door. Now, it’s handed over to your iPad or iPhone. You’ll be surprised to find out how the camera works in iOS 5. It’s got new amazing features such as the capability to open the camera straight from the lock screen, single-tap focus, exposure locks to create pictures while you are on the go and the option to use grid lines. But what we like about the camera in the iOS 5 is that you can now use the volume-up button to capture photos. It’s that easy. The awesome features of iOS 5 doesn’t stop with the camera. You can also easily convert snapped pictures into fully-edited photos. You can enhance, crop, resize, rotate and even use the red-eye remover in the Photos app itself. Organizing your photos into albums and synchronizing them with your iPad via iCloud is also now possible. With the iOS 5 comes a totally revamped Safari browser for your iPhone and iPad. The new Safari browser now comes with tabbed browsing for more flexibility and the all-new Reader which enables users to view articles without the unnecessary clutter. Wait, Safari is also now equipped with Reading Lists – a feature which allows you to save pages for further reading. We’ve got exciting news for all iOS users out there. The iOS 5 is also PC Free. This means that you will no longer need the support of a Mac or PC to download software updates. This also means that you can now activate and set up your iPhone, iPad or iPod Touch wirelessly straight from the box. Thanks to iCloud, all your valuable files are now stored automatically in the cloud. Both the Mail and Calendar applications in the iOS 5 are also overhauled for maximum usability and performance. The new Mail app is now capable of formatting texts and dragging names in address fields. You can also flag important messages and use indents in your text messages. Pretty cool huh? The Calendar app now comes with a year view for advanced planning in the iPad and a special week view on both the iPhone and iPod Touch. With the newly improved Calendar in iOS 5, you can tap your screen to immediately add an event or rename and delete calendars. Adjusting the time and duration of a specific event is also done by simply dragging the values. Apple has also enhanced the Game Center in iOS 5. New concepts were added and other gaming systems such as support for turn-based games like Scrabble, game downloads within the Game Center app, game discovery for playing with whoever wants to play with you at any given time, photos in your own profile and accessibility to friends are now included as well. Truth be told, the features that we mentioned above are just a tip of the iceberg. 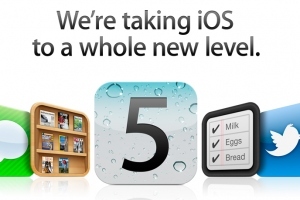 The iOS 5 has over 200 new features and we can’t name them all here in this post. Other notable features of iOS 5 which we think might interest you are Cards – for making awesome digital cards straight within your device, Dictionary Everywhere – use it anytime in every application, iTunes synchronization over Wi-Fi, advanced multitasking gestures in the iPad 2, AirPlay monitoring, longer battery life, parental controls, user-defined keyboard shortcuts, custom vibrations for stealth alerts, LED flashes for visual alerts, alternate routes in Maps, app usage checker, more fonts, the iCloud, split keyboard for the iPad 2, em and en dashes and a whole lot more. So, now you tell us why you shouldn’t get the new iOS 5 update right now.